I have a hard time turning off my brain and shutting down for the night. It's not uncommon to find me responding to work emails at 3 am or planning for my upcoming day. I end up taking "naps" throughout the day or night, and not actually having a healthy sleep routine. I've always thought this was just how I work. It's not like I'm setting an alarm for these naps, especially not in the middle of the night. But my brain wants to work, right? Wrong. You guys, this is not the healthiest habit of mine. I'm a do-er. I always want to be progressing and working and moving forward. But I can do this, without sacrificing something my body needs. Sleep. So, when I was trying to figure out how I could turn off my brain at night (because if it were easy, it would have happened a long time ago, amirite?) I came across the old tried and true tip of being technology free for the last hour before bed. Sounds great in theory, but I needed something to distract myself during this time. I had to come up with a new nighttime routine that would help relax me before bed, but also keep me technology free. I found a space in my house that I found calming and peaceful. For me, that was this corner with my Mabel Bookcase where I keep so many things I love. I took extra steps to ensure this was my peaceful place. Now, this is where you'll find me each night before bed, re-centering myself. I've found it super relaxing because I can keep all the things I need here for my new nighttime routine - my books to read, my music to calm me, and my candles I light so I can let go of all harshness to my day. 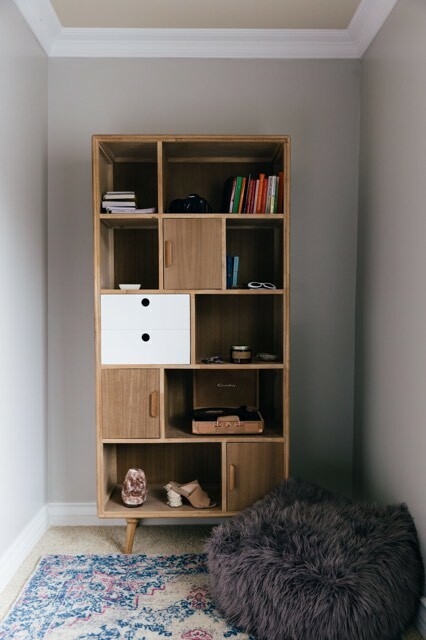 There are so many components to my bookshelf, it makes it easy to stay organized and stay focused on my ultimate goal - relaxing and getting a better night sleep. PS - If you don't have a place like this yet set up in your own house - you can get the same bookshelf I have (on sale right now!) from Apt2b, my go-to for decorating my new condo.